Probably Not a John Jacob Jingleheimer Reference | Comics I Don't Understand - This site is now being updated daily at http://www.comicsidontunderstand.com. Please change your bookmark if necessary, and notify any web site with a link to the old address. Are you sure you didn’t miss the caption on this one? It has some of Gary Larson’s cartoons brought to ‘life’ with the magic of photoshop. Someone out there must have that huge “COMPLETE FAR SIDE” book, right? Without seeing the caption, all I can tell about this cartoon is that the guy waving goodbye is supposed to be some sort of psychoanalyst. That’s how head shrinkers were invariably drawn in cartoons back then. The other guy seems to be a senator, but he doesn’t look much like one. He looks more like a refugee from the margins of an R. Crumb comic. And do senators really carry briefcaes with their own names writen on the side in HUGE capital letters? Incidentally, was this cartoon printed on a napkin? 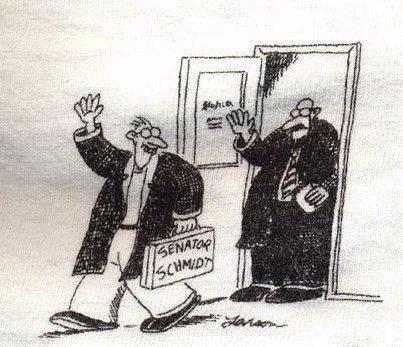 I’m thinking possibly the man with the case isn’t Schmidt, but someone being sent off to campaign for Schmidt. Perhaps the ‘psychiatrist’ is Schmidt…. Yeah, I think there’s definitely a missing caption here. Instead of investigations along the “Far Side” route, I googled for “Senator Schmidt” and found an article entitled “Pharmacy Commends Senator Schmidt for Ensuring Uninterrupted Access of Medicaid Patients to Needed Medicines” about some issues with Kansas prescriptions. It was the first Google link, but you need to use the cache to see the article. So, I’d guess this cartoon is trying to espouse, correctly or not, that the senator is possibly influenced by the medical establishment (i.e., why are the pharmacies, and not the patients, commending the senator for providing continuous access? One would speculate that the patients who actually need the medication would be far more grateful…). By the way, Senator Schmidt from the article is female – but I an unsure whether this cartoon is referring to the same one. Does this help? Larson rarely, if ever, got that topical. I think it might have something to do with the sandwich in the doctor’s hand… Maybe? I have read the complete Far Side collection twice, but I don’t remember this comic (however I may have just forgot). Technically, Larson did draw things that weren’t comics for a magazine or newspaper. The book, “There’s a hair in my dirt!” is a must-read! Actually, if you’re going to purchase the book, use Bill’s Amazon link and support the continuation of this website. He just gave him a Schmidt sandwich. It looks like it’s scanned from a T-shirt. I’m guessing it’s a bootleg that someone has doctored to add the “Senator Schmidt”. The strip you attached to your e-mail is indeed a Far Side cartoon. There is not a missing caption; the cartoon is intended to run as it appears here. While Mr. Larson does not offer explanations of his cartoons, my personal understanding is that the humor comes from the fact that a senator would be exiting a psychiatrist’s office. The implication seems to be that someone who makes our laws is potentially mentally unstable. Thank you for your interest in The Far Side. I hope that clears things up for you a little. Nice work, Brian. If that’s all it is, it’s *really* disappointing. I’d be careful about putting The Far Side and CIDU together. The Far Side could totally consume it. Hey I finally looked back at the CIDU and there is a beautiful answer. Thanks Guys. I asked Bill about this one as living in Australia I thought there maybe a local slant to this one. I can’t remember where I gleaned this one from. If anyone every wants to find a cartoon I am glad to help, I will locate in my database of Far Side cartoons.